Reap the rewards with Doosan – an introduction to produce growers. Recently, we shared a blog post with you which was a guide to potato and root crop farming, however they are not the only farming applications where you will see forklifts. 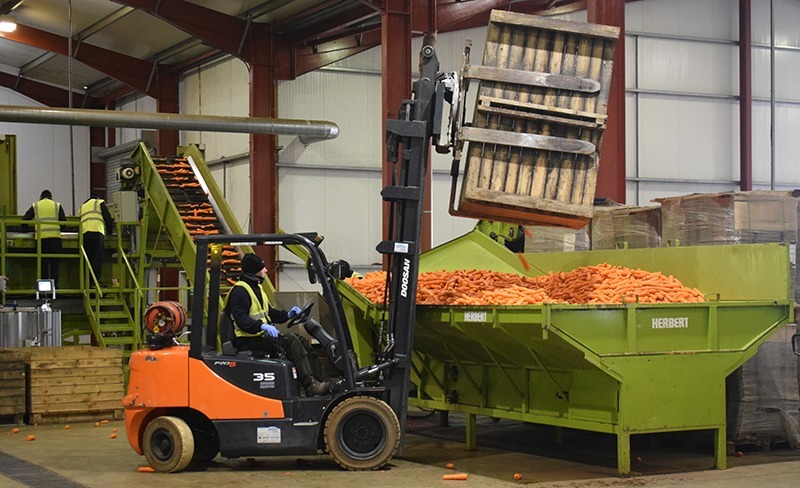 Along with root crops, you’ll also see a large number of forklift trucks, powered pallet trucks and other pieces of materials handling equipment in fruit, vegetable and salad farms and their processing facilities. Today, we’re going to take you on a guided tour of these applications, from the farm gates right to the loading bay. So, let’s get started! Ideally in this environment, a truck which can operate both indoors and outdoors would be beneficial to the operation. However, when working indoors the environment needs to remain as clean as possible to protect the quality of the produce (particularly when working with fruits). In this situation, you may see a gas counterbalance forklift in operation. Gas powered trucks offer high power output similar to diesel forklifts, however they do not produce any soot; helping to keep environments clean. An additional benefit to the Doosan gas counterbalance trucks, in particular the 2.0 tonne capacity truck is that it is on a compact chassis; offering increased manoeuvrability. This is also something that not all manufacturers can offer. However, gas trucks are not the only option, electric forklifts would also be suitable for use in this case. Electric powered forklift technology has made significant advances, meaning that they can deliver powerful performance similar to their engine powered equivalents. Electric counterbalance trucks also do not produce emissions, becoming an environmental benefit; they can also be a more cost effective than engine powered trucks when recharging as opposed to refuelling. Once the produce has been washed, prepared and packed; it is placed into chilled storage awaiting transport. The size and weight of these loads will be relatively small when compared to the size of loads being transported in to the facility, allowing a smaller truck to be used. For example, an electric counterbalance forklift with a lift capacity of 1.0 – 1.5 tonnes would be suitable for the size and weight of loads being transported; an additional benefit is that these trucks, particularly if they are 3-wheel versions, have a small footprint; increasing the amount of storage space available. Now we’re on to the final leg of our journey; loading delivery vehicles to take the produce to its final retail or wholesale outlet. In this area of the facility, small crates of packaged produce are moved from chilled storage to the back of delivery vehicles. Generally, this is where you’ll see powered pallet trucks travelling from chilled storage to the back of delivery vehicles along dock levellers. Powered pallet trucks are ideal for this application as they have an extremely compact footprint, allowing multiple trucks to operate in the same area; increasing the amount of throughput generated. Another reason why powered pallet trucks are favoured in this environment is due to the amount of foot traffic in these areas. Forklift trucks are considered more of a danger in areas where pedestrians are frequently found, as a result of this powered pallet trucks are generally considered the safer option. Here at Doosan, we provide a comprehensive range of forklift trucks, powered pallet trucks and stackers which are tough, reliable and simple to use and would help to improve safety and productivity in these operations. If you’d like to find out more, contact us or call us on 01604 825 600 today.